Herewith the last in the series of comments on the proposed alienation on the Portion of Erf 595 as envisaged by the Local Authority. What will follow hereafter is a Summary of the numerous comments as received from the Community in response to the articles as published by the W2F (Ward 2 Forum) team. The full document as submitted to TWKM by the Ward 2 Forum Team will also be published for general information to the W2F database & on Social Media. The following proposals are part of a larger concept that includes a considerable increase in the area of the Greyton Nature Reserve. The community of Farm 39 intends to register Bakenskop & potentially parts of Snyerskraalkoppe, to the West of Loerkop, as a Nature Reserve. This will eventually form part of the proposed Greyton/Genadendal Biosphere. A new company is formed with the above parties as shareholders. The shareholders’ contributions are illustrated in the accompanying graphic. The major portion of the fruit farming, as envisaged, is not done on the proposed portion of Commonage, but on a 200ha portion of Farm 39, whilst a portion of the Commonage is retained for grazing, a biological corridor and current recreational activities. This arrangement will have much less impact on neighbouring Greyton and addresses most of the concerns noted from Greyton residents. Clearance of Sonderend River of alien trees and protection of the river banks. 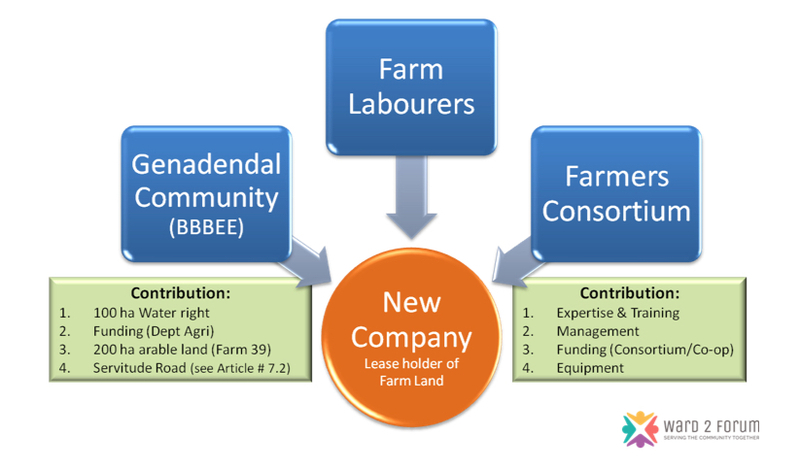 Additional opportunities for joint ventures between Farm 39 and the Consortium. Platform from which to launch similar projects throughout the Overberg. This alternative is an intrinsic part of our objection to the original proposal and as such should be considered together with the objection. This is the preferred concept from Ward 2 Forum, which is subject to modification and agreement between all parties concerned. There could be significant changes resulting from the EIA and the public participation process, from input from TWKM, the Consortium and Breede-Gouritz Catchment Management Area and after detailed discussions with the Departments of Agriculture, Land Affairs & Water Affairs. After reading the above swiftly, and I might have missed something whereby I stand to be corrected, there still seems to be the notion that the common land of Greyton as left in the will of the late Sir Herbert Vigne belongs as an asset to TWKM. TWKM can therefore negotiate certain terms and conditions. I cannot agree with this as never in the past, to my knowledge, has the property owners of Greyton relinquished their rights to the common land in question to any other body. The land therefore still rightly today belongs to the property owners of Greyton and no governmental body can lay a claim to this or enter into any negotiations on behalf of the owners, as should the land in question belong to them. And this fortunately or unfortunately includes TWKM. I suggest to the property owners of Greyton that we take this matter to the Constitutional Court for a clear ruling. Thank you for your swift response to the “Final Report” – you are 100% correct in your understanding of the intent of the Herbert Vigne legacy as reported and confirmed in our report # 2016/15 (https://ward2forum.org/vigne-legacy-greyton-commonage-report-2016-015/) and that is the standpoint that we have adopted from the outset. The land is not for sale nor will it ever be. The legal position of our understanding and interpretation of the intent of the Vigne Legacy can naturally be tested in the courts of the land etc. However, it is view of the Ward 2 Forum that the spirit of the Vigne Legacy is not up for debate or interpretation – it is crystal clear. The land has been left to the community/residents of the area for common use, and as such we have built a workable solution that addresses all the relevant issues & expectations of the respective and interested parties. For Greyton as a community to flourish economically and socially we need Rural Development and the only way to achieve that would be to involve the community as a whole. Which is exactly what the Vigne Legacy is all about. We need to protect our environment by stopping the sale of and alienation of communal assets. For too long the communities have been at loggerheads and apathetic to the indiscriminant development and willful irregular, fruitless and wasteful capital expenditure by the local authority. The 10 reports published thus far by the W2F has consistently pleaded that we need to ensure the protection of our communal property and has therefore based it proposals on that premise. The W2F Objections Document will be submitted to TWKM by the 31st Mar’16 and will be published on this platform for as general info document. The time has come for a unified front from a broad based community supported organisation to address these issues. Your support would be greatly appreciated.